You are in the range: Washington D.C. The Old Patent Office Building takes up the entire block bounded by 7th and 8th streets and F and G Streets, NW. 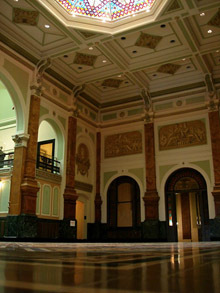 After six years of waiting and extensive renovation, the building reopened in July 2006 as the Donald J. Reynolds Center of American Art and Portraiture, home to two of Washington's off-the-mall treasure-houses: the National Portrait Gallery and the Smithsonian American Art Museum. 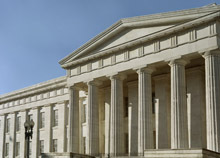 Like other major federal buildings, the Patent Office Building was constructed in stages, starting in 1836; the final wing was completed in 1867. 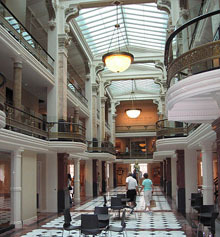 The building was important to the young republic for many reasons: it housed the agency that issued patents and it displayed the models of inventions that demonstrated the energy and ingenuity of Americans. During the Civil War, the building was also used as a hospital; among its most famous staff members was Walt Whitman. 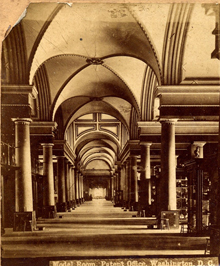 The original architect for the building was Robert Mills; his successors were Thomas U. Walter and Edward Clark. In 1877, when Carl Schurz was Secretary of the Interior (with an office in the building), a fire destroyed the third floor and attic of the west and north wings. Major renovations to the building were then carried out by Adolf Cluss and and his partner, Paul Schulze. 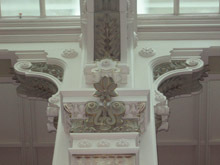 They rebuilt three of four of the topmost halls. Although they matched the classical exterior, they greatly enlivened the interior. During the years of restoration, Washington photographer Amy R. Boles, in cooperation with the Smithsonian's Office of Architectural History and Historic Preservation, took a series of dramatic photos of the spaces. See the website: A Different Light: Photographs of the Old Patent Office Building. Cluss and Schulze's new Model Hall introduced a new structural system designed to improve the fireproofing of the building. Finishing materials such as the encaustic tile floors and the wrought iron railings were not only fire resistant but added both decorative complexity and color. 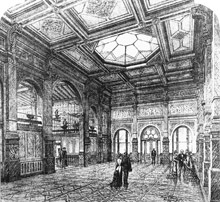 Cluss made no attempt to alter the familiar Greek Revival appearance of the building from the exterior but made dramatic changes to the interior. Now that the building has reopened, the halls Cluss decorated with colorful floors of encaustic tiles and marbles once again appear in pristine condition. Visitors are also able to see the beautiful stained glass Cluss added to the building as part of the magnificent entrance hall and Model Hall galleries. A small exhibition about the building itself, including sections about Cluss and Schulze’s work, is on view in a special gallery. The Smithsonian has also announced its intention to replace the grand exterior staircase on the south side of the building, designed by Cluss in 1872-73 and demolished in 1935-36.